Fermented vegetables problems can easily be avoided. 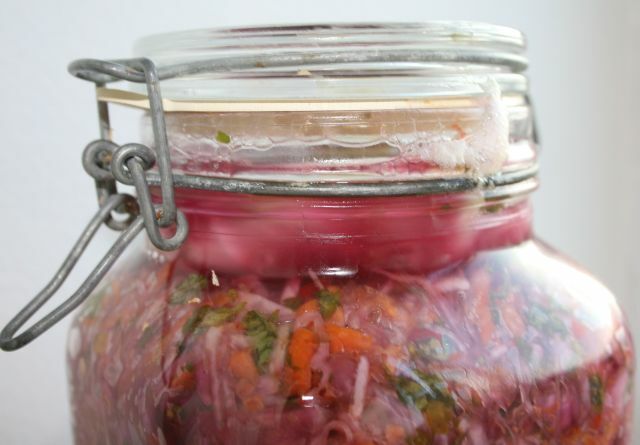 Fermented vegetables are simple to prepare at home if you follow the basic principles and recommendations. However, when dealing with live bacteria some factors cannot be completely controlled. This is the beauty of fermenting vegetables. Is not rocket science and therefore, problems sometimes occur. I hope this article can help you understand why certain problems occur and what to do about it. If you’re using a starter culture, the main concern will be to keep an eye on the temperature. This is one reasons why I always use a starter culture. It makes fermentation much more stable and predictable. A starter culture contains potent bacteria strains that quickly take control of the vegetables and suppress harmful microorganisms like mold. Unwanted microorganisms: The presence of unwanted microorganisms can cause breakdown of proteins and produce an undesirable flavor and changes in texture. However, such problems can be avoided by following the simple guidelines I use in every recipe on this site. Good hygiene: Use only clean tools, utensils, and jars. Clean your hands and rinse all vegetables in water. The reason is often because the temperature is too high during the 5-7 day fermentation. I’ve had this problem a few times. Once I put the jars to ferment in a cupboard next to the stove. And when we cooked food on the stove the temperature in the cupboard became too high and this affected the fermentation process. The fermented vegetables were still tasty but the texture was too soft and mushy, not very appealing. This experience gave me a vital lesson—control the temperature. Most people prefer crunchy fermented vegetables. They are so much more enjoyable than mushy ones. If you’re making sauerkraut without a starter culture there are some additional factors to consider. The wild sauerkraut fermentation process follows a few stages in which different bacteria strains must grow in a certain sequence. However, whenever the desired sequence of bacterial growth is changed or disturbed, it often results in soft, mushy vegetables. For example if allowed to, some lactobacilli strains break down cabbage and make it soft. If the temperature is too high or if too little salt is added, this can promote the growth of lactobacilli because they are sensitive to higher concentrations of salt. A normal concentration of salt used in sauerkraut will slightly prevent the lactobacilli from taking over, but it does not disturb the cocci bacteria strain. Therefore, stick to the recipe when it comes to salt and keep an eye on the temperature and you should be fine. The most common reason for this is the presence of unwanted microorganisms during the fermentation process. Too much salt in the jars can also disturb the growth of healthy organisms. Excess salt can promote the growth of unwanted, salt tolerant bacteria or yeast. Another common problem that I’ve had a few times is allowing a too low level of brine in the jars. Too little juice tend to invite unwanted bacteria and yeasts to grow on the surface of the vegetables that are not completely covered by brine. This can cause a discoloring (often brown) and a bad flavor. However, if you intend to consume the veggies quite fast, then this might not be as important. Also, if the fermentation temperature is too high, it can stimulate the growth of undesirable microflora, which results in a darkened color. But dark colorored veggies at the top does not always mean the taste is bad. TIPS. Fill the jars 70% with veggies, the rest with brine. Make brine by juicing cabbage or celery. Use enough brine to completely cover the vegetables in the jars. When fermentation is complete and you put the jars in a cool place, check the level of brine. The brine has a tendency to become low after a day or so. If you don’t have juice, then use filtered, cool water. Using red veggies like cabbage or beet root will coror the entire batch. However, if non-red vegetables turn pink, then this is often caused by a group of yeasts that produce an intense red pigment. For sauerkraut the reason can also be an uneven distribution of or an excessive concentration of salt, both of which allow yeast to multiply. But this is rare. If your green vegetables have turned pink, you might not want to eat those. Usually a whitish layer floating on the surface is a yeast called kahm yeast. It can develop as the lactic acid bacteria consume all the sugar and the pH of the ferment drops. This layer of yeast may have a textured surface almost resembling spaghetti. Just remove the white layer and discard it; the vegetables below the surface should still be OK.
A common reason for the development of kahm yeast is that vegetables are not submerged in brine, or the container is not sealed well. Maintain an air-free environment for the vegetables. Follow the instructions given in other posts about how to cover the surface with cabbage leaves to keep the fermenting vegetables submerged in brine. Mold more easily develop in warmer temperatures, so during fermentation try to keep your veggies in a location that does not get over 70°F. Again, culturing temperature is too high or vegetables are not fully submerged in the brine. If you’re not using a culture starter, you might need to add more salt in the brine to prevent bad microorganisms to grow. However, if too much salt is used, this will not allow for adequate lactic acid production which can cause other problems. Other causes for mold are harmful microorganisms present on the vegetables before you culture them, or unclean equipment or covering cloths. Be sure to rinse all veggies thoroughly. If mold is present in the jars, avoid consuming the vegetables because they will be unpalatable and unhealthy. Some vegetables contain more sugar like beets, apples and, carrots. Foaming is not bad in any way and usually disappears quickly. During fermentation you might observe bubbles in the jars as gas is formed by the probiotic bacteria. This is OK in a normal fermentation. Some form can leak out from the jars when pressure builds during the process. This is normal. However, if the lids are too tight, you might want to open them quickly to let excess gas out. During fermentation, the good bacteria are transforming sugar into other complex substances as acid and gas. This is normal, but it can also smell quite strong. However, it should never smell rotten or mold. If your batch smells rotten or mold, then something might have gone wrong. Too high temperature is a common reason. Also, unclean equipment, dirty hands or a poor culture starter can all contribute to this. If your batch smells really awful, you might don’t wan to consume it. Taste it to make sure. If slime-producing microorganisms are present, your brine will look unappealing. Again, a too high temperature can cause this, but also too little brine in the jars so that some vegetable are not covered. Some pickles can also cause the production of slime. If you add too much salt you risk changing the sequence in which different bacteria work. This is especially so with preparing sauerkraut without using a starter culture. What can be done if there is too much salt added? Try adding more liquid into your jars to dilute the salt. Use freshly pressed cabbage or celery juice. You can also use filtered water. If you use a culture starter and celery juice for brine, then some people don’t add salt. But I think the veggies taste much better with salt. I’ve fermented many batches both with and without a starter culture and in my experience using culture starters is far better. However, only use a high-quality culture starter. This happens every time I prepare my batches; jars are bubbling and some brine is leaking out. This is completely normal! It shows that the good bacteria is hard at work. Now you see the reason why it’s best not to fill the jars completely full with vegetables. Fill your jars 75% full; then the brine has some space to expand in the jar. During the fermentation process don’t put the lid on too tight, just enough to shut air out but also allowing gas to escape from the jars. The pressure in the jars can be very high, like in a bottle of Champagne. Yeasts can settle at the bottom of the jars. But as long as the vegetables look and smell OK, you can consume them. However, if they are slimy or look moldy, don’t eat them. During fermentation lactic acid is created which can create a cloudy brine. 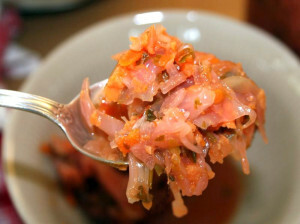 Lactic acid is what gives the fermented vegetables the tangy, refreshing taste. This acid is considered very healthy. At the start of the process vegetables might be very colorful. I often use 5 to 10 different vegetables in my mix and they all have strong colors. But after a few days of fermenting they turn pale or sometimes the entire jar turns pink. This is because the friendly bacteria in the jar is transforming the vegetables, including the colors. This process is harmless, even essential and shows that everything is OK. Many times the ready product will not have the same color as the original vegetables. Some specialists believe this is due to different metals reacting with pigments in the garlic. It has happened to me a few times when fermenting garlic. The garlic does not seem to be harmed in any way and the taste is great. It just looks funny. However, be careful of using garlic together with other vegetables as the garlic will completely dominate the taste. It might be better to ferment garkic in separate jats. But if you love garlic, then just go ahead! If the room temperature is too low, the bacteria will take more time to get to work. Ideally, probiotic bacteria need around 70°F for optimal fermentation. However, in temperatures around 60 degrees fermentation will slow down, but not stop. In fact, fermentation will continue even in the fridge, only very slow. Taste the vegetables every two, three days to determine when they are ready. I’ve fermented vegetables for 10-15 days and the result was still great. So be patient and taste from the jars. This is yet another good reason to use a good culture starter as it speeds up the fermentation process. Thins are much more stable and predictable with a starter culture.